Seriously, I wish I knew. I tell myself I work better with the pressure of a deadline looming (which seems to be true), I tell myself that I have lots of responsibilities and I have to prioritize (which is true) but honestly, I don't know. Isn't that the truth! I do think that external deadlines really help, but I sure wish I had that shot. The second is the most important because if I'm the only one holding myself accountable, I tend to let myself slide. I really need someone to check in with--whether it's an editor, business partner, or teammate. 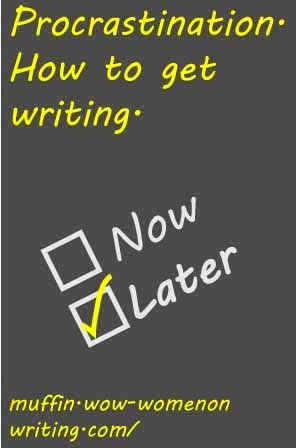 That's why my novel gets put aside but my copywriting doesn't. I prefer to think of it as "research for an as-yet-undefined-project-that-most-likely-will-involve-yet-another-new-story-despite-the-fact-that-I-already-have-more-works-in-progress-than-Imelda-Marcos-has-shoes" than procrastination. You say po-tay-toe... I say po-tah-toe. Seriously though... my characters seem to have a knack for talking themselves into a tight spot and leaving it up to me to sort things out. That is when procrastination steps and and says "May I have this dance?"